Last Saturday night, Mommy Jane was invited to join the Ramadhan food review at Bangi Golf Resort. This is the first time Mommy Jane been to this place after reading lots of good review from my blogger friends. It is also the time for Mommy Jane to explore and try out the food here especially Ramadhan is approaching soon and Mommy Jane just love the spiciness and uniqueness of the Malay food. Bangi Golf Resort ("BGR") had a great dining place with its panoramic view of the 27-hole designed golf course and refreshing air. BGR is set to charm everyone with their signature Buffet Ramadhan happening soon from 29 May 2017 to 23 June 2017. With over 200 dishes, BGR Restaurant offer a sumptuous buffet spread featuring popular Malay, Western and Oriental cuisine. At the BGR Cooking Showcase, the chefs had served up portions of freshly carved roast lamb and piping hot bowls of mutton stew which never fail to warm up our stomach. The Beef and Chicken Satay were freshly grilled as well as Fried Kway Teow and Fried Mee Mamak which were wok-fried "live". Simply delicious especially Mommy Jane loves hot piping food. 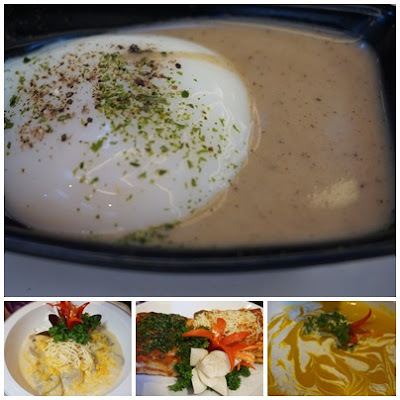 Mommy Jane's favourite dish is the Sous Vide Eggs with Mushrooms Espuma at the Western Section. Half boiled egg mix with the mushroom sauce. Once you had it, I'm sure you will ask for more. Yummy... Chicken Lasagna and Golden Sand Spaghetti Carbonara are delicious too. As for the Malay cuisine, do try out their Nasi Lemak Istimewa. 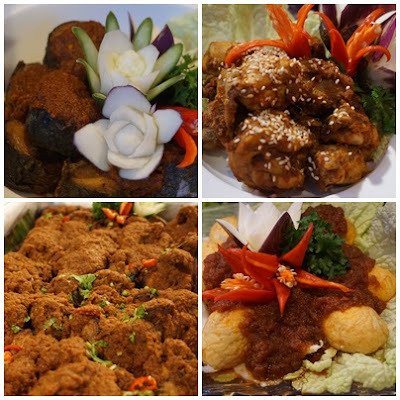 The humble Malay national rice dish is accompanied with a sumptuous selection which include Tendang Daging Taik Minyak, Sambal Sotong Kembang, Ayam Bercili Masak Ketumbar, Ikan Masak Asam Kari and Telur Rebus Goreng Masak Sambal Tomato. For the Oriental cuisine, BGR Restaurant had perfected the technique of preparing Hainanese Chicken Rice where each piece of the chicken is cooked just to the point of doneness that gave them a succulent texture. The fluffy grain rice are enriched with rendered chicken fat which leave them glistening and flavourful and top it up with the fresh garlic and ginger chili sauce, I'm sure you'll ask for more. Mommy Jane was impressed with the various selections of desserts available. My favourite is the Spanish Churros with Thick Chocolate Sauce and Signature Italian Tiramisu. There are homemade Malay kuih as well as a variety of puddings, agar-agar and tropical fruits. Be spoilt for choice with creations such as Serawa Durian, Assorted Swiss Rolls (Red Velvet, Orange Jaffa & Macha Chocolate, Lychee Rose Cake, Tropical Nectar, Caramel Surprise and Banana. Indeed a new range of desserts that have been added in 2017 that guarantee you a feast on a sweet note. Besides having a wide selection of dishes for the Ramadhan review, do look out for the "Durian Runtuh" section where freshly harvested durians from Raub, Pahang are selling at a special price. Mommy Jane loves the freshly churned gelato from Sweet Scoopz who is a gelato producer known for its Musang King and unique P.G.A (Passion Fruit, Guava & Asam Boi) flavours. Both durians and gelatos are available for takeaway and diners are entitled to exclusive discounts. Live performances entertaining guests from 6.30 p.m. till 9.30 p.m. daily to add to the atmosphere while enjoying your dinner. BGR had ample of complimentary parking lots too as well as Male/Female prayer hall for guests. 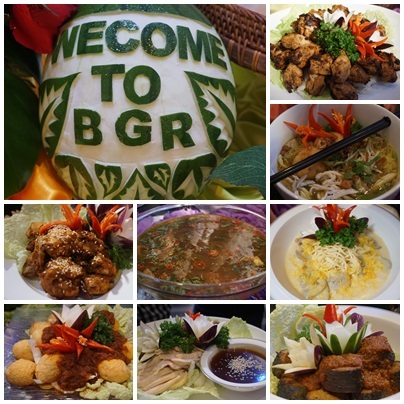 BGR Restaurant is located at No. 1, Persiaran Bandar, Bandar Baru Bangi, 43650 Selangor Darul Ehsan. For more information, do visit their website at www.bgrrest.com and follow them at their facebook page at www.facebook.com/bangigolfresort to get the latest promotions. Do call them up at 1-700-81-8557 for reservations to avoid disappointment later since their buffet is worth the price. Prices start from RM58 for adult and RM25 for children. Mommy Jane with Blogger friends and all the awesome Chefs and PR for the event. Thanks to BGR Restaurant for the invitation to the media preview for their Ramadhan buffet. Thanks for the good food, good entertainment, good environment, good friends and everything which had planned for all of us. 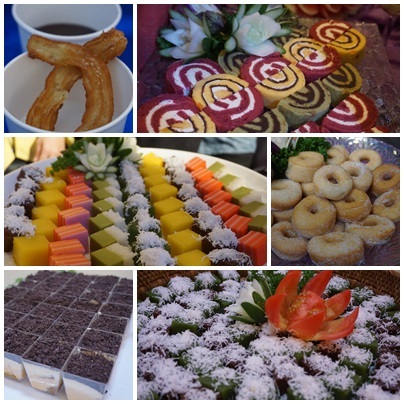 Mommy Jane is in love with all the delicious food here and the variety of choices for the dessert. 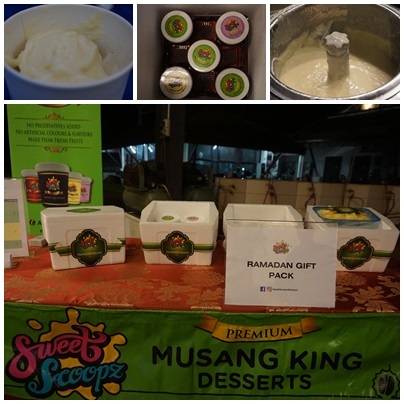 The "Durian Runtuh" party is truly a great one where Mommy Jane able to eat the fresh durian from Raub and the Musang King ice cream is just refreshing. Mommy Jane definitely will come again to enjoy the Ramadhan buffet with my Little Angels later and I'm sure they will love this place as much as I do. I love ramadan buffets it's the only I'll indulge in that many food.l and I love the durian in the end. Jia Shin, me too. They had variety of food to choose from and nice durian too. Omg that durian looks so good! I have a love hate for ramadhan buffets.. love the variety but hate the wastage..
Buxom, the durian indeed good. Most of the food had eaten by us. love to eat durian too. Now I wanna hunt for food like above! Gonna check this place soon. Food looks delicious. Price is reasonable too. Fatin, remember to call for reservation to avoid disappointment coz' normally the restaurant is full house. I've not been to Bangi Golf Resort before but the Ramadan spread is really to die for. Hope to have a chance to buka puasa here next month. Emily, then you should try it out too. Enjoy your Ramadhan buffet. hi Mommy Jane. i've been there too. love their satay and carbonara. and cakes too. everything are delicious. Hanny, this is my first time too. Hopefully will see you again soon for the buffet.